Street-working children in Kabul are now able to play football on an all-weather pitch, thanks to funds from the Linda Norgrove Foundation. The Foundation gave £10,000 to help provide the pitch for the Aschiana School for Street Children. 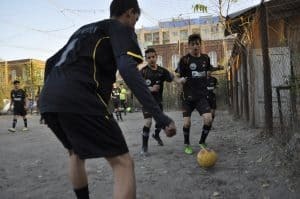 The previous normal pitch was a dust bowl in summer and a mud bath in winter, but was the only place in Kabul for street-working children where both girls and boys were able to play. The Aschiana organisation has two girls’ teams for ages 10 to 12 and 13 to 15, and three boys’ teams for ages ranging from 10 to 18. My name is Abdul Waris, one of the players at ASCHIANA football team and a player of the Under 18 National Football Team. I am thankful to Aschiana that they provide us the opportunity, where we are able to play football and through that we are able to play at the national levels. I have an experience of playing at the old pitch that was not a standard pitch, but now we all are so happy of playing at a standard football pitch. We all members of the football team are thankful to all those who made and built us this football pitch. The previous pitch was a dustbowl in summer. My name is Narges, one of Aschiana’s football team members playing for the past two years. Before, we were playing on a normal football pitch and it was difficult to play with the girls at the national level, because all the girl teams playing at the national level are playing on a standard [all weather] football pitch, so we were not able to reach to their level. I am so happy that I am now playing on a standard football pitch.